The goal of this article is to provide the readers a basic technical understanding for big data applications in the health care system as well as provide information to develop or integrate various technologies with definite possible positive effects as return. This article, Real-time Big Data Analytics in Health Care Using Tools From IBM, does not cover the other areas of application of Big Data Analysis, like predicting trend of communicable diseases such as flu, influenza or genetic analysis. There are already known existing ready to solutions. Data sources can be stationary data sources in which, both the device and the person under question are not moving. These data sources include as example, patient monitors, and devices which measure air pressure, temperature, humidity to sleep trackers. Mobile data sources are from the wider range of ​​devices such as wearable computers and smartphones. Sometimes, this segment is erroneously identified as “Medical Device Data”. Data can be generated via Image Processing or Signal Processing. In this context, data is generated via signal processing. Wearables are small portable computers which should allow new communication capabilities, complementary to the smartphones and existing devices. Wearables are becoming increasingly important in our society’s day to day life as well as in healthcare industry. The areas can easily be guessed – streaming real-time data usually captured by the devices like patient monitors which are designed to collect data like ​​cardiac rhythm for analysis from sports field for optimization of the training performance to the field of ambulatory or inpatient medicine as an aid for diagnosis of heart diseases such as, for example, hypertension, heart attacks or cardiac insufficiencies, or in research and development, for example artificial pacemakers. Other similar fields are real-time data collected by blood glucose monitors such as glucometers, sleep evaluation tools etc. 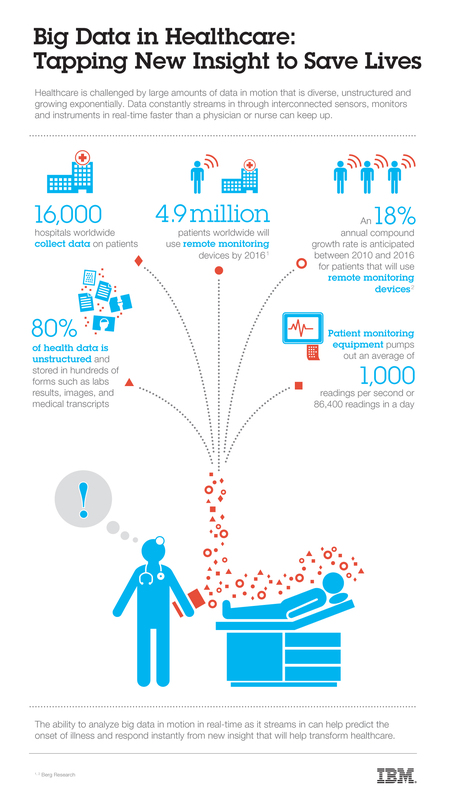 For medical studies wearables are becoming more and more interesting and opening up completely new possibilities. Descriptive statistics: Structuring existing data and determining key figures such as average, variance or extreme values ​​for better assessment of the data. Exploratory statistics: Systematic analysis and production of causal connections from the available data. Also, analogous to webserver log data, collected real-time data in healthcare can be stored and obviously analyzed later. Privacy and healthcare standards always a big hurdle for this segment. Healthcare industry always generate large amounts by record keeping, compliance & regulatory requirements, and patient care. Most of these data can easily be stored in hard copy form, although the current trend is toward rapid digitization. Oddly, the real-time monitoring data by modern devices such as in-OT, in-ICU streaming data against blood pressure readings to EKGs are mostly ignored in fields such as trauma patient monitoring, operating room monitors, anaesthesia, operating theatres possibly due to the nature of being less known to the non-healthcare individuals. Currently available medical devices widely vary in the context of IEEE standards related to Healthcare and Electronics. Also, many of them lack the initiative to embrace usage of open source hardware technologies. Some of these embedded devices has no way of data retrieval in any format. Also a remote possibility of collective social phobia associated with the phrase Big Data Analytics in healthcare may be liable for such lesser penetration. Also, many healthcare providers are not aware of the possibilities of usage of the already available tools for Big Data Analytics in Health Care and Real-time Big Data Analytics although, the nature of data source does not hugely vary compared to a webserver and later is widely known to many type of users. In any case, one may want to install all the softwares on own on-premise servers which are actually hosted, managed by Bluemix for streaming data ingestion. The methodology essentially is streaming data ingestion with the Kafka for real-time analytics. Batch processing is for processing data gathered over a period when fast response time is not critical. Streaming data ingestion with the Kafka is faster. Apache Drill enables self-service data exploration on big data with a schema-free SQL query engine. Most of our existing guides to install the required components to build on-premise own real-time big data analytics in context of healthcare is possible but a costly alternative. At present, most of the standard big data analytics vendors offers managed Free Software/Open Source based solutions with minimal proprietary components. Cite this article as: Abhishek Ghosh, "Real-time Big Data Analytics in Health Care Using Tools From IBM," in The Customize Windows, August 7, 2017, April 21, 2019, https://thecustomizewindows.com/2017/08/real-time-big-data-analytics-health-care-using-tools-ibm/.